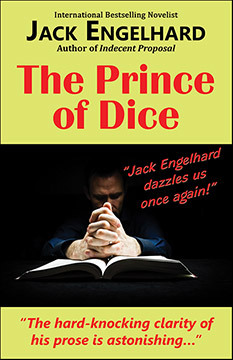 The hard-knocking clarity of his prose is astonishing... Jack Engelhard is back, and in The Prince of Dice he dazzles us once again as he has in such novels as Indecent Proposal and The Bathsheba Deadline, to name but two of his works that testify to Engelhard's genius. Who is Julian Rothschild? Julian is the star of Engelhard's Prince of Dice and from page one to the end you will love this guy. He is a hero styled after the lonely gunman who comes to wipe out evil and save the town. Only Julian carries no guns. He carries a pair of dice. These are his weapons. He is a gambler, but he is different. Julian has been blessed with a gift. He has the magic touch. He can't lose. Something happened when he found himself in the Sinai Desert. Something holy. His gambling, he feels, is directed by a Divine Hand. Against a world that tries to bring him down, Julian must keep proving himself, until finally it's a matter of life or death. You will love this novel from Jack Engelhard... "A writer without peer, and the conscience of us all." "The Prince of Dice is a riveting masterpiece about people trying to save their sanity and their skins in casinos, mostly in Atlantic City. A passionate must read for all lovers of the game, and even those who aren't." Contemporaries have hailed novelist Jack Engelhard as “the last Hemingway” and of being “a writer without peer and the conscience of us all.” The New York Times commended the economy of his prose... “precise, almost clinical language.” His bestselling novel Indecent Proposal made him internationally famous as the foremost chronicler of moral dilemmas and of topics dealing with temptation. Works that followed won him an even greater following, such as Escape From Mount Moriah, his book of memoirs that won awards for writing and for film. His latest novel Compulsive draws us into the mind of a compulsive gambler in a work stunningly brilliant and original, and seductively readable. Mention the title, author and/or ISBN 978-1-77143-218-4.